Well if this isn’t going to start a trend this Halloween, I don’t know what is. What can be cooler than our countries greatest president kicking but as a vampire slayer?! 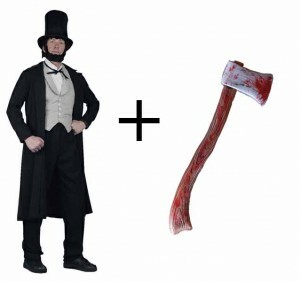 There is no shortage of Abraham Lincoln costumes and vampire costumes, as well as civil war costumes for that matter. 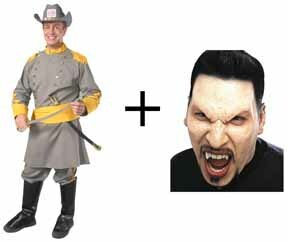 All can be incorporated into an Abraham Lincoln Vampire Hunter costume theme. It is an even greater group costume. Someone dressed up like Lincoln and be accompanied by a group of vampires. If Abe can save the nation from being taken over by vampires, then you can surely keep the party safe. You could also one-up this costume theme by wearing the Abe Lincoln costume, wielding a prop axe to add vampire makeup too, sort of making Honest Abe a president, vampire hunter and vampire all in one. People will definitely get the point. Abe learns of vampires and how to hunt them long before he became involved in politics. Vampires were a problem but the issue really escalated when Lincoln became president and sought to end slavery. In the movie, many confederate soldiers were vampires who opposed abolition because slaves were used to feed the vampires. On the Union side, they knew that vampires had an aversion to silver and won the war with the aid of silver rifles. Sounds crazy? Yes. Perfect for Halloween – YES!